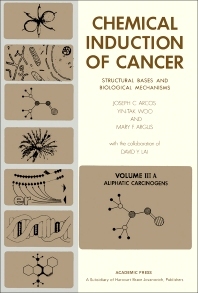 Chemical Induction of Cancer: Structural Bases and Biological Mechanisms Volume IIIA deals with the organic and biochemical principles behind cancer. This volume contains the continuation of Volume IIA, which tackles structure-activity relationships of chemical carcinogens, the effect of chemical reactivity, molecular geometry, and metabolism on carcinogenic activity. Under this is non-conjugated organic compounds. The text is recommended for doctors, organic chemists, and biochemists with an advanced knowledge in biochemistry and organic chemistry and would like to know more the biochemical processes of cancer.